Bunny Facts: How Fast Can a Rabbit Run? 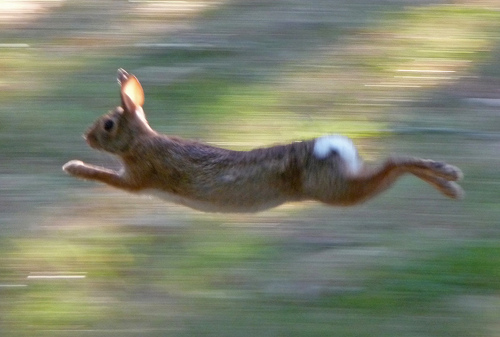 We all know hoppers are a quick bunch, but exactly how fast can a bunny run? Without giving you the roundabout, we’ll go ahead and drop the facts – an average rabbit can run anywhere from 25 to 45 mph (40 to 72 kph). If you’re a bit surprised, so are we, but the given figures shouldn’t come as too much of a shocker. Rabbit bodies are designed for running and hopping, with strong legs and well-sprung muscles allowing the little fellows to basically outrun cars in more extreme cases. The particular bunny’s breed, age, type and overall health conditions are of course some of the key speed factors. If we were to discuss the particular bunny types, snowshoe hare stands out as one of the slower bunch and can reach the speed of about 27 mph (43 kmh), while jackrabbit ranks as the ultimate speed bolt and can run up to previously mentioned 45 mph (72 kph), making it the fastest rabbit breed. So could a pair of bunny slippers possibly make you run faster? Well, no. This entry was posted in Bun Fun and tagged Rabbit Run on December 13, 2013 by BunnySlippers.